William was born in 1853 in Henry County, Alabama. William is listed in the 1870 census of Henry County, Alabama (along with Isidor's other children at the time) as is Minerva Roberts, his future wife. William and Minerva were married in Santa Rosa County, Florida on March 19, 1874. William and Minerva had four (4) children: Edward, Ella, Oscar and Henry. Minerva apparently died within a year of delivering their youngest child Henry (possibly while giving birth). Henry was born in March 1879 and by the 1880 Henry County, Alabama census, William along with three of his children (Ed, Ella and Oscar) were living with Isidor. William is listed as a widower and Henry had been adopted by the C.S. Kincey family. Sometime after 1880 and before 1990 Ed went out on his own; it is reported that Ella died; and Oscar was "taken in" by the William McKissick family. 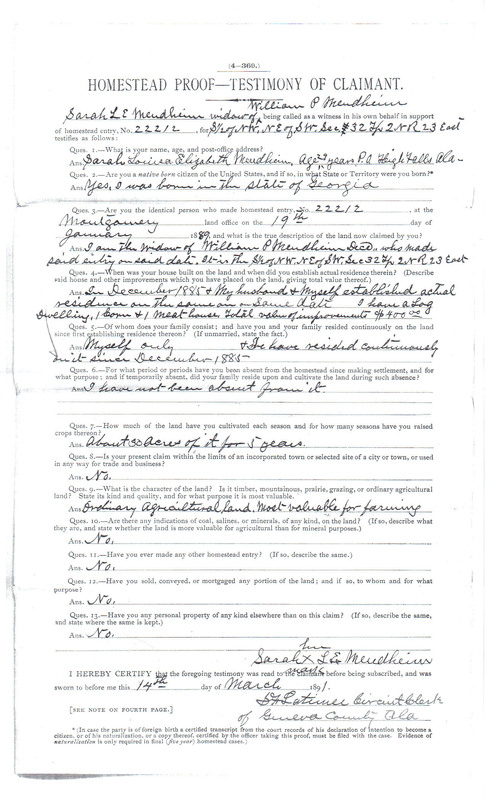 William applied for a homestead in Geneva County, Alabama on January 17, 1889 stating he took possession of the property in 1885. On March 14, 1891 Sarah L E Mendheim ("widow of William P Mendheim") filed final papers for the homestead claim and the "homestead patent" was issued January 18, 1892. The property was located in High Falls, Geneva County, Alabama. Apparently William had married Sarah Louisa Elizabeth Grantham sometime between 1880 and 1885. Subsequent to William's death she married Mack Spikes and she was listed as Sarah LE Spikes on the 1907 tax rolls for the property. Ed (Charles Edward) and his family lived in Geneva county close to the homestead property.